Thank you very much to Tran and Romain for their help on this page! 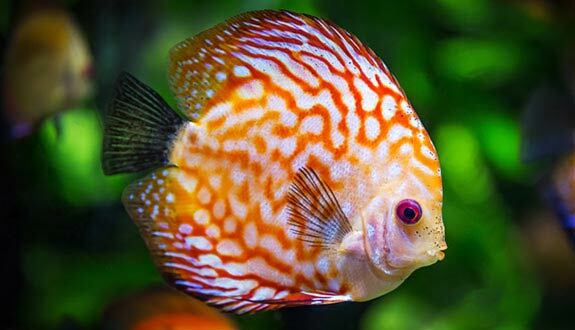 This species of Discus is the most widespread in aquariums. The many colours of this beautiful fish attract many enthusiasts. Moreover, aquarium clubs are entirely devoted to him. Discover the fascinating world of Discus here! Not very visible: the male is generally larger and its dorsal is more pointed. More obvious during breeding (genital papillae). How to feed the Discus? 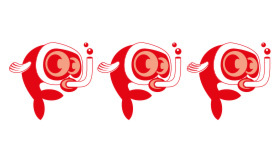 It is an omnivorous fish with a carnivorous preference. It will appreciate varied menus and especially live or frozen prey. You can give it dry pellet food (avoid flakes, less suitable for surface feeding). 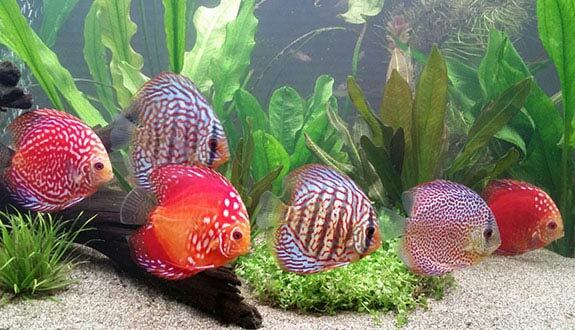 Feed your Discus in several small meals a day (which can be consumed in less than 5 minutes) by checking that all your fish have eaten because the dominant individual could starve others. 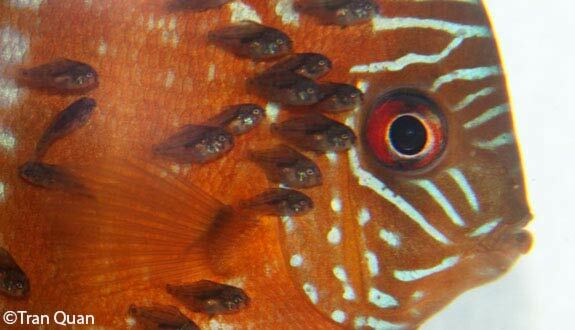 What kind of behavior does the Discus have? Discus is a calm and peaceful fish. 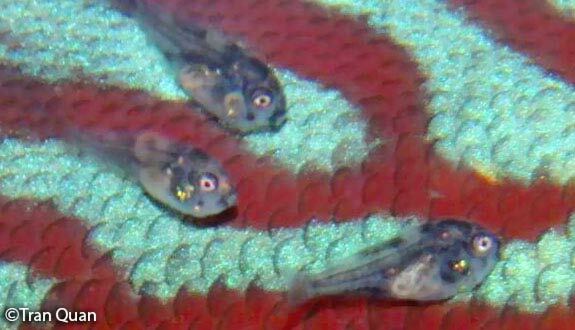 However, as a good cichlid, it is quite territorial. Its group develops a distinct hierarchy and sometimes there are some tensions between individuals. It's pretty paradoxical but the Discus live in a group, but do not tolerate the presence of other people of its species! It is then necessary to take some precautions (cf "Its aquarium"). It is a fish easily subject to stress. Its colours darken if under stress (it is also the case at night but in this case it is normal). We can see the appearance of very dark black bands on its body. 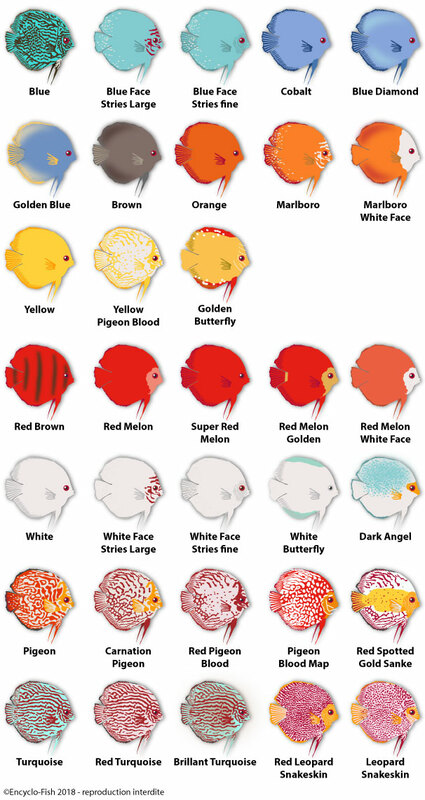 In case of constantly darkened colours, check the environment of your fish, roommates and the quality of its water. It can be aggressive and particularly territorial during the breeding season. 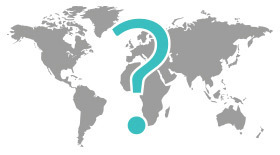 Who can live with the Discus? 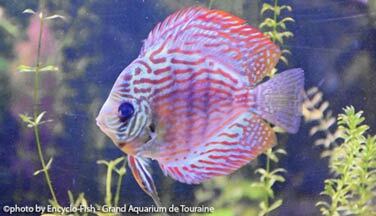 Discus is a gregarious fish that desperately needs the presence of congeners to thrive. 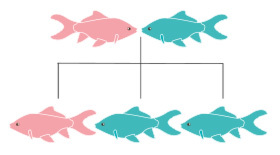 To leave it alone or with only 2 individuals is a torture for this group-loving fish. 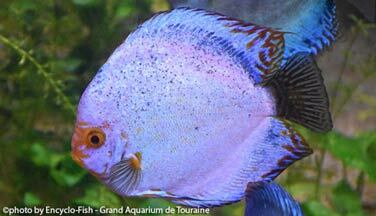 Thus, Discus will ideally combine in a shoal of 6 individuals in 450 liters (99 imp gal / 119 US gal) minimum. 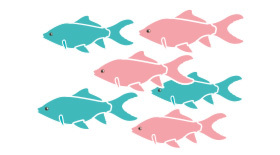 If you want to introduce new individuals into an already established group, opt for younger fish that will have a better chance of integrating, but this is never guaranteed. The main precaution to take when choosing roommates will be their size! 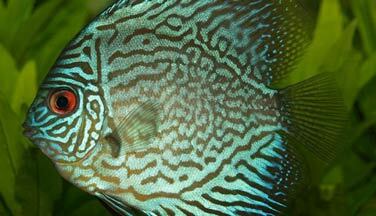 Indeed, the Discus is a good predator who will not hesitate to eat small fish, shrimp, small snails or fry. Therefore, for a nice shoal of fish accompanying your Discus, opt instead for the Cardinal Tetra / Cardinalis (Paracheirodon axelrodi) rather than the Paracheirodon innesi that is likely to be eaten. 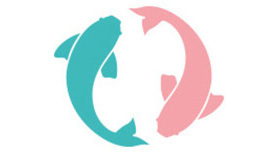 Its fearful nature will prevent cohabitation with fish that are too big, aggressive, or territorial. 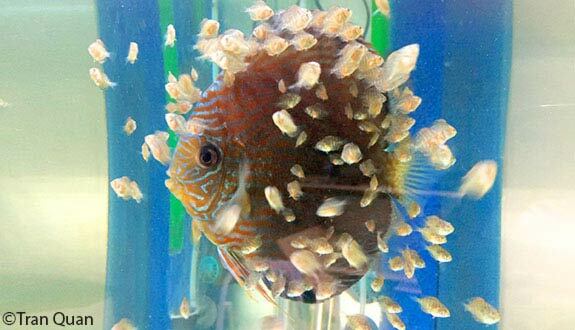 How to breed the Discus? Contrary to what one can read regularly, Discus are not monogamous. So you can choose the fish that interest you for breeding. 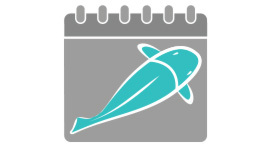 Note that a young fish can take up to a year to reach sexual maturity. Their breeding is quite difficult. You will need to invest in a 125 liters (27 imp gal / 33 US gal) aquarium specifically dedicated to their breeding (50x50x50). The key to success is in the water parameters, which must remain very stable: temperature above 27°C or 80°F, KH less than 5, nitrates less than 3 mg/l, conductivity at 150/250 microsiemens. 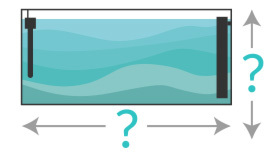 To obtain these parameters, the use of osmosis water is essential. In the breeding aquarium, install spawning supports: cones specially designed for this purpose, roots, large smooth stones, pieces of slate... In general, the laying support must be smooth and inclined. Isolate a couple. Note that breeding is often carried out in the main tank if it is sufficiently spacious but it is very rarely carried out. If the pair is ready to breed, they will start by thoroughly cleaning the laying stand. The female then deposits the eggs that the male fertilizes immediately. The eggs are 2 mm in diameter and are under the care of the parents, who protect and ventilate them. A few days later, the fry will be born. Interestingly, they will feed on a special mucus secreted by their parents! So do not remove the parents from the breeding tank before hatching because you would condemn the little ones. Feeding fry: When they no longer consume the mucus from their parents, feed them with young artemia nauplii. Which aquarium for the Discus? The Discus is a pretty high fish, in the shape of a crushed disc. It is therefore important to have an aquarium with a good height! 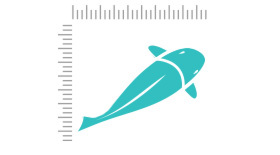 For swimming, plan a front length of at least 1.5 meters or 60 inches. 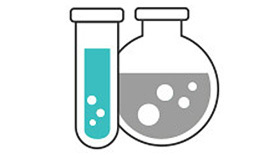 Keep nitrite as low as possible and nitrates close to 0. For this, renew the water by up to 10% each week (ideally expect 5% every 3 days). 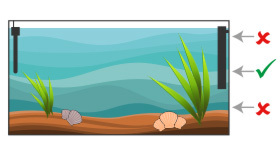 Given the water parameters recommended for Discus, you will use reverse osmosis water to reach the required values. Be careful to heat the replacement water before transferring it to the aquarium to avoid any heat shock. All these parameters must be very stable in order to guarantee the good health of your fish. Decoration side, it is essential to provide many hiding places. Indeed, it allows the individuals victims of the aggressiveness of the dominant to evade the latter. If there are no hiding places, it could weaken individuals at the bottom of the hierarchy. Be careful because some weaker fish could fall into the opposite extreme and not even go out of their hiding places to eat. Watch that all your fish feed properly. 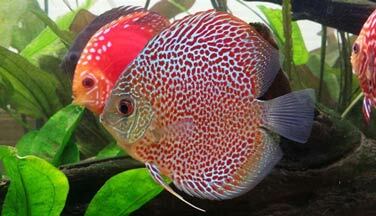 What are the colours and patterns of the Discus? It is a fairly fragile fish, sensitive to changes in parameters and drugs. Its maintenance is reserved for confirmed aquarists. The recommended size for its purchase is 6 to 7 cm or 2.3 to 2.7 inches. Below, it will be too delicate for the maintenance that most amateurs offer. Moreover, even at this size, it is still very young and growing. It will therefore be necessary to redouble attention as soon as it arrives, especially for food. Discus is particularly prone to intestinal worms. They then develop symptoms like leanness, loss of appetite, swollen belly, white and filamentous stools, a hollow above the eyes. You can worm them preventively once every three months, with Prescoli or Fluvermal to limit or prevent attacks. Its stripes are a camouflage in its natural environment: it thus merges with the decoration rich in wood root. It is this species of Discus that is particularly common in aquaristic (we meet very rarely Symphysodon Discus and Symphysodon Tarzoo).